If the City Speaks, its dialect is cool, languid. Its time is the dark flow of the night. Often understated playing brings to life a unified set of harmonically rich compositions. 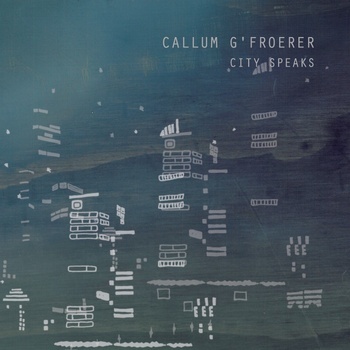 Melbourne-based trumpet player Callum g’Froerer has assembled Andrew Brooks on alto saxophone, Brett Thompson on guitar, Alex Boneham on double bass and Hugh Harvey on drums and cymbals, and each player is allowed to showcase their technical abilities and improvisatory sensitivities. Across City Speaks, space is always in abundance. The soloist never overplays, and the accompaniment from the rhythm section is engaging without stealing the show. City Speaks opens with the title track, a burst of energy uncommon to the rest of the album. An agile, driving double bass and drums set is contrasted with clusters of picked notes on guitar and long tones from trumpet and saxophone, evoking a unique “burning” and “impressionist” combined effect. A brief interlude amidst the driving momentum, featuring scattered trumpet and sax shrieks, preempts the later track Trio, which opens with a howl of half-choked gestures, like animal calls, that give way to a sustained, swelling soundscape. The next three compositions form a complementary trio. Silver Platter is built around an angular melody reminiscent of the idiom of trumpet player Scott Tinkler, with double bass and trumpet building into an impressive crescendo before subsiding back like a wave. At first solos are handed back and forth between Boneham and g’Froerer. 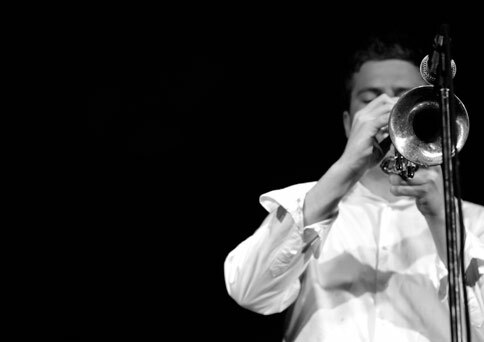 The trumpet player’s longer solos are clear and melodic, mixing familiar elements of post-bop with an emerging harmonic language influenced as much by local trumpet players like Paul Williamson and Peter Knight as the finely wrought balladry of Wynton Marsalis. The Thinker opens with trumpet and guitar in a more melancholy mode, before proceeding with a melody that, in its twists and turns, reminds the listener of Miles Davis on the recordings of his second great quintet. Andrew Brooks takes his first solo of the set, showing off a singing tone to match the clarity of g’Froerer’s trumpet. Sweet-Ness X3, slow in tempo and brooding in character, again evokes Miles (particularly the classic Wayne Shorter composition Nefertiti from the 1967 album of the same name), with the focused high register of gG’Froerer coloured by moments of sublime ensemble harmony, especially when trumpet, sax and guitar combine. A feature of Brooks’s playing is the way he blends his sound with g’Froerer, producing a hybrid, slightly brass-edged horn chorus. In Gemmani, muted trumpet gives a new perspective to the musical landscape mapped across the album. Searching and shifting, the piece is structured around a descending guitar and bass figure, reminiscent of Radiohead. A wonderfully sonorous section of lone guitar is the centerpiece of the composition, and one of the highlights of the album. Like the title track, Virginia contrasts a brisk walking bass part with long tones in unison from the horns and guitar. With its through-running melody, the piece binds the album together, as does the final track, a remix of the opening composition. Re-mixer Kynan Tan retains the original haunting horn lines while adding twittering, anxious complexity to the bass and drum material. Kynan’s re-mapping of City Speaks translates the nocturnal passage of the whole album into something like a spinning dreamscape.